What a great, inexpensive way to entertain children at any event. Simulated bees are sent up a beautiful, 14 foot tube, propelled into the air by the hidden fan in the whimsical cone assembly. The mounted lights inside the cone really make it glow. Once the colorful bees swirl their way to the top of the tube and out, they gently flutter to the ground while the children try to catch them with the custom nets. Because the nets are connected to their bodies at the waist, it is impossible for them to accidentally strike one another. 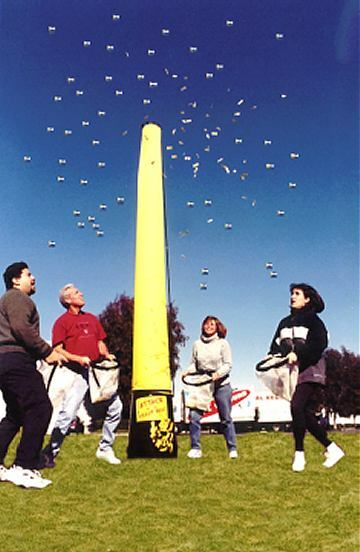 The object of the game is to catch as many bees as possible. Lookout for the special queen bees, they are worth bonus points. The game sets up in five minutes, is priced to sell and is destined to be a favorite.